Normal is boring. That’s why the Mini Cooper was created. Voted the second most influential automobile in history (behind only the Ford Model T), these little cars have been making big statements on the roads of Evansville and Newburgh. It takes a special kind of driver to own a Mini, and it takes a special kind of automotive shop to repair them. That’s why Menke’s is proud to be the top rated Mini service facility in the area! Owners want to trust that their Mini Cooper is being serviced with the most current technology available for their car. 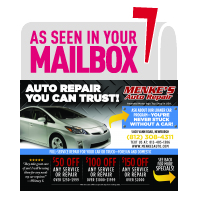 Menke’s is fully equipped with the latest diagnostic equipment and from simple tune ups to sophisticated programming resets, Menke’s has you covered for all your Mini repair needs. Our shop has factory approved scanners, computer assisted engine diagnosis tools, and over two hundred and fifty years of combined experience to get your compact car back on the road. Thinking of buying a pre-owned MIni? Bring it in for a pre-purchase inspection by the meticulous technicians in our state of the art facility. Each member of our staff is ASE certified to repair and service your Mini, and Menke’s itself has received the ASE Blue Seal of Excellence for automotive service. We were even recognized as the 2009 “Top Shop” nationwide in Motor Age Magazine, and received the Angie’s List 2013 Super Service Award. With quarterly training updates on the newest equipment and technology available anywhere, you can be sure that your Mini is in the hands of the best foreign car specialists in the area. Leading the Way in Automotive Repair!